HOME > restoration contemporary art- restoration and . . . 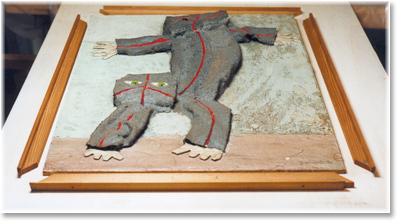 Here we present an example of the restoration of a contemporary painting: a multimaterial work (70 x 56 cm) composed of mortars, sand, glass, fabrics, acrylic paints and wood (plywood) painted by Carlo Guarienti in 1970. 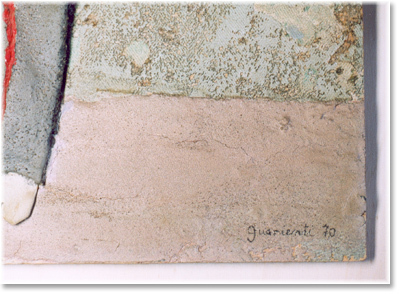 The lower part of the work presented shrinking and horizontal cracking of the pink ground, applied on a 1 cm-thick plywood panel. These problems were probably due to desiccation of the material. 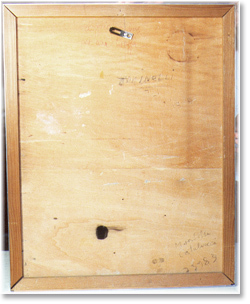 In addition, a vast delaminated area, small gaps, a large vertical crack (to the left of the signature) and a semicircular one (on the right) were caused by compression exerted by the metal frame on the wooden panel; bending elastically, the panel became detached from the overlying rigid material. 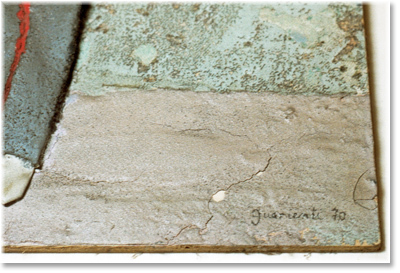 The cracks and delaminations to the right of the signature had been consolidated in a previous intervention. Dust was present in the crevices and protruding surfaces. The restoration began with dismounting of the frame, which was not without difficulty because of the wooden fillets forced against the sides of the plywood panel. They had been inserted without leaving any space for expansion of the materials. The wooden fillets were thinned to leave space for expansions of the support and to facilitate the mounting in the rigid metal frame. The large delaminated zone was consolidated with injections of Primal AC-33, a acrylate-methacrylate copolymer in emulsion. The transparent white milky liquid does not yellow after drying, and it exhibits excellent resistance to UV radiation, good chemical and mechanical stability, a low propensity to reticulation and thus good reversibility. This consolidant was chosen because of its excellent adhesive capacity and permanent flexibility and elasticity. 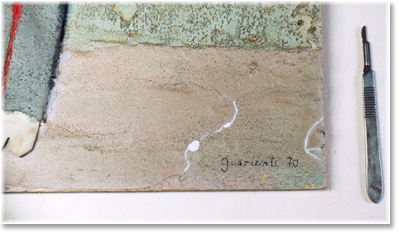 The gaps and vertical cracks were filled with synthetic plaster and the surface was matched to the conformation of the surrounding area. Inpainting was carried out with watercolours. The inpaintings are easily reversible by light application of moisture, harmless for the original materials. Dust was removed with a soft brush and micro-aspirator. 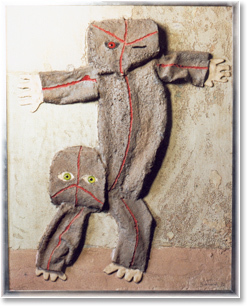 The work was remounted in the frame in the order in which the materials were found.